Enjoy Charlaine Harris's Books? Tell us Why and Win a Free Book! Welcome to Charlaine Harris's BookGorilla Author Page! We're working hard to bring you the best deals ever on Charlaine Harris's Kindle books. 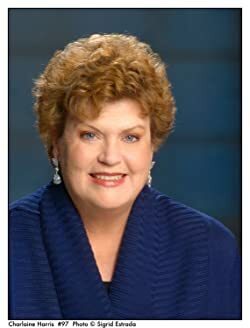 If you’re a Charlaine Harris fan, we'd love to have your help in making this author page special. Tell us, in no more than 150 words, why you think Charlaine Harris is great. Use this webform to send us your submission, and if we select yours we'll offer you one of Charlaine Harris's books or a Kindle Gift Card as a free gift! Thanks! Please enter your email address and click the Follow button to follow Charlaine Harris! More people are turning up dead, and Harper might just be falling for the town's deputy, a handsome, rugged man whose wife died under mysterious circumstances...Based on acclaimed and NYT Bestselling author Charlaine Harris' hit Harper Connelly series, the first book of which is Grave Sight.